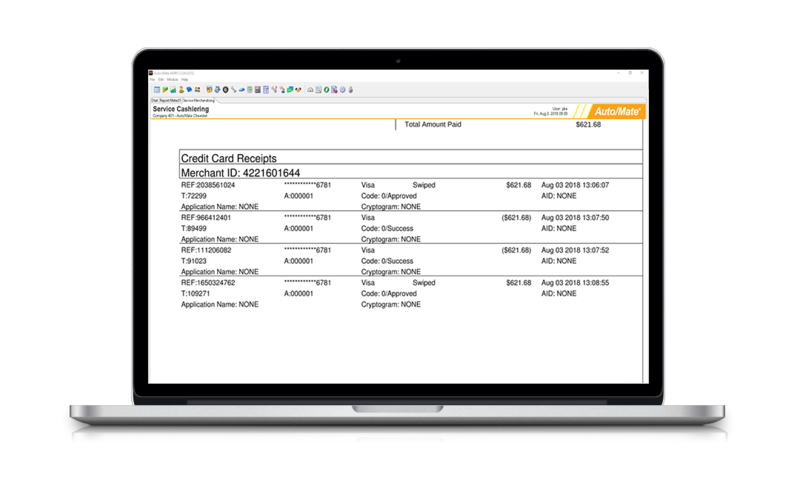 Auto/Mate’s Credit Card Processing Engine from Worldpay allows cashiers and counter people to accept credit card payments, capture digital signatures if paired with eSign for Cashiering and automatically post payments into our Cash Receipts Module. With our integrated workflow between the POS and the DMS, your card reader will detect the card type (Visa, Mastercard, etc.) and securely store that information onto the customer record in the DMS. Save lost time and opportunity for incorrect data from manually entering in individual payments into the system. Let our seamless integration do it for you — the right way! Auto/Mate doesn’t charge a dime for this feature. By using Credit Card Processing, you’ll be a Worldpay Merchant Card Processing customer and Worldpay will either match or beat what you’re paying your current credit card processing provider. Worldpay provides complimentary, detailed pricing analysis to Auto/Mate users. Experienced pricing experts from Worldpay will survey your existing practices to reveal money-saving business methods and recommend tactics to optimize your financial payment rates. 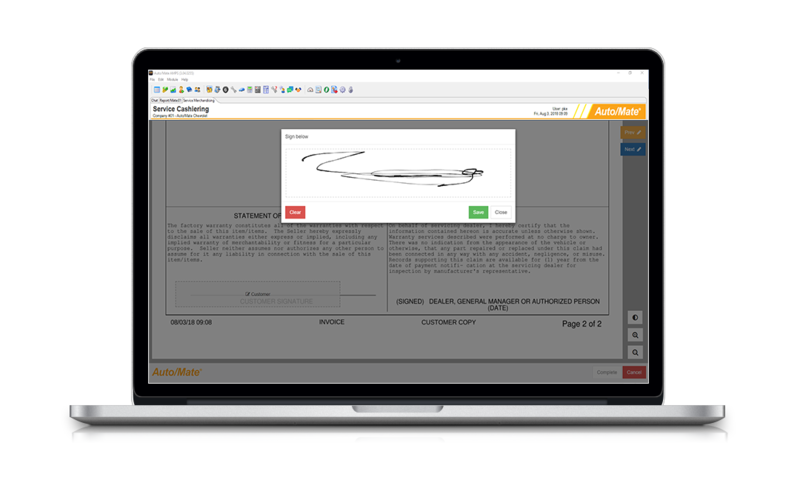 When paired with eSign, you’ll also eliminate dependency on paper spools, printing and scanning to provide your customer a copy of a receipt that is likely to just end up lost in a purse or the back of the car. 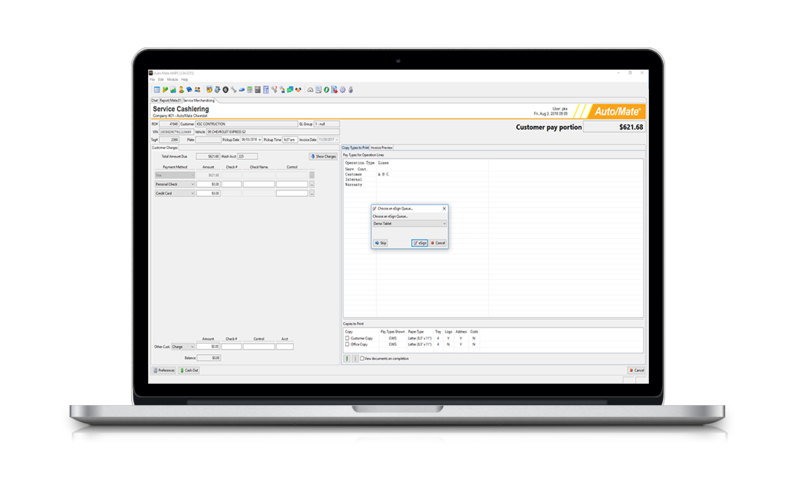 Auto/Mate’s integration with Worldpay reduces duplicate accounting efforts. No longer do you need to match reports from the terminal and the point of sale. Worldpay’s portal tracks all transactions, providing for robust reporting and easy reconciliation. All transactions are pushed over to the Cash Receipts module in real time, eliminating manual posting as well as duplicate and incorrect entries.